This week, MJ has a super simple sketch! I decided to rotate the sketch to fit my images. 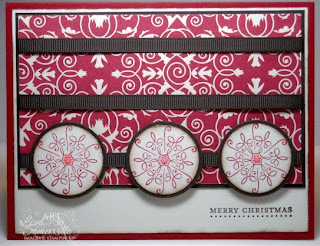 I inked up Serene Snowflakes from Stampin' Up! with Real Red, stamping on Vanilla card stock, punching with the 1-1/4 Circle Punch and sponging the edges with Soft Suede. I added a dab of Rock Candy Stickles to the center of my Snowflakes for a bit of bling. This looks great, Lisa! Love your design! Lisa your card is beautiful! I love how you used ribbon instead of strips of paper/cardstock! Great idea! This is great! Sorry I am so late getting to comments. I am buried again lately. I love the colors on this. Fabulous job with the sketch, thanks for always being there with a card for this sketch challenge! You rock.